Now I have to admit one thing... before I met T-chan, I was not a pork eater. In fact, I don't think I would have ever bought pork myself. Well, T-chan was a little shocked by this when we first met, and I'm sure it was one of the things that gave her pause when marrying me (as she loved pork). Luckily for her - or should I say me - I came around to eating pork quite easily. And one of the important reasons was tonkatsu or pork schnitzel... or more strictly, pork cutlet. pork fillet - about 1+ cm thick... not typical thin schnitzel cuts. Now - this is really as simple as a normal schnitzel, where season the pork with salt and pepper on both sides before you coat the pork liberally in flour (we toss in a bag), then dip into the beaten egg before coating in the breadcrumbs. Then it's into the saucepan with about 2 cm deep of boiling oil for deep frying. Always test out the temperature of the oil by dropping in some breadcrumbs or a small piece of pork. It should boil and raise to the surface very quickly if it's hot enough. Note - if you've got lots of left over egg/breadcrumbs, try double coating (just repeating the process before deep frying). This is an easy recipe, but it does tend to get a little messy... especially the way I do it. Tonkatsu is often served with rice and cabbage thinly sliced... if it's on the rice it's called katsudon (where don effectively means served on rice) - though this also involves beaten egg as well. We often put a dressing of Japanese mayonnaise (e.g. Kewpie brand) and tonkatsu sauce over the shredded cabbage. Now the pork fillets we had were quite small, so we didn't need to cut them up. Typically in a shop in Japan you'd have them served already cut into strips. Below is a photo of a tonkatsu bought just around the corner from T-chan's house. Hmmm - getting hungry writing this post. This is one of my favourite dishes... and I never would have thought that I'd be saying that about a pork dish. But seriously, I love it. We went to the National Railway Museum down at Port Adelaide yesterday... and if you're from Adelaide, and you have children, you most probably would know that the museum runs an annual week-long event where they do a "Thomas the Tank Engine" theme. This is the first time that any of us had been to the museum though I'd been meaning to go for some time. For this event, entry is pretty steep - $19 per adult, and $6 per child... and also a little inconsistent. They have a family deal for $40 for a family of 2 adults and 3 children. Er... That doesn't make a whole heap of sense. Always ask for the family deal if it's cheaper (and ignore the 3 kids part). The entry fee also doesn't include all costs involved - and rides on the three trains cost $3 per person, with children 2 and under free. Once again... this seems to be more a guide than a rule... and L-kun travelled for free. Note - it's significantly cheaper if you go outside these event times. Now there's not a whole heap of Thomas things there... other than a lot of merchandise. They do have their own "Fat Controller"... or Sir Totham Hatt if you please, who is the roving MC. Not to mention crowd-control, what with his Trouble Book. And of course, they do have their own "Thomas" too...which the kids can ride around on a large circular track. Actually the face-plate's a special even thing... normally he's known as "Bub"... according to his name plate. He also needs some help from a second engine (a Percy lookalike)... hiding behind. The other main non-Thomas attraction is Peronne, a narrow gauge steam train that is used on special events. The trains don't go very far - and this is one criticism of the museum... in fact they just go for about out of the compound, past the aviation museum before returning. So don't go in with expectations of a long trip. Still, it's a fun experience for the children. The inside of the Peronne carriages are a fun way to travel. It's also great to open the windows (a little difficult at times) and enjoy the smell and sound of the old steam locomotives at work. The Museam was started in 1963, and the buildings date from 1988... Now the museum is really just that... it's where you'll find a slice of the rail heritage of the state (if not the nation). And there is a fair bit of heritage there with lots of different trains, and different styles of trains. Most of the carriages can't be entered, and this would be something that I hope changes. It would be much nicer to make the exhibits more interactive, or at least accessible. There are a number of static displays and re-constructions (e.g. of rail offices) but they're separated from the viewer, so once again, aren't very interactive. There's a very good model train that spans perhaps about 25-30 metres of table that stretches around one of the rooms... and takes in a model of Port Adelaide, Terowie (strangely mis-named Tarcowie, which is another mid-North town) and the Adelaide Hills. The rail network in Australia developed haphazardly, and as a result there were a number of different gauges (widths) employed even within the State of South Australia. This eventually always limited Australian rail as a means of transport due to the need to tranship all goods from broad to narrow gauge. Actually, Terowie has a special place in our family history, as it did for many South Australians during the height of the rail commerce in Australia. Indeed during WWII, Terowie, this was the site of a huge Army camp used as a staging point due the need to transfer rail gauges. From a height of 2000 residents, the town has declined to barely over 200 as the rail line was removed in the 1980's... a testament of the importance of rail, and the country's dependency on the lifeblood of commerce and work. Overall, my impression of the museum is a little mixed. I think that the "Thomas" event is over-sold, as there's not really much there that is specific to the series. There are however lots of side attractions, such as bands, magicians, entertainers and a Jumping Castle. L-kun (it may surprise you) is not the most expressive child when it comes to "events"... but he actually was very happy to run around here all day (we spent a good 5 hours). I think it's overly expensive (I can't imagine taking a lot more children there) for what you get, and it really needs to be more involving. However, as a piece of our relatively short history it has an important part to play. Just thought I'd throw out a plug for a small, but gorgeous eatery in Adelaide; Steven ter Horst Chocolatier at 221D Unley Road, Unley. We came here a while ago now, after a night out with some friends of ours that had recently returned from Japan. Actually, they had known the owner, Steven, from a previous line of work and had introduced us. The claim to fame are the hand-made 'Belgian' chocolates... and there's a wide enough selection of these to keep even the most ardent sweet-tooth happy. Including L-kun, who was mesmerised by all of the different types of chocolate. But it was late, so he only was allowed one. Parents can be so cruel. Supposedly, all the chocolates are named after female figures in his life... don't ask me who the 'Hedgehog' was named after though (I suppose she knows who she is). But the one thing is that they all look absolutely delectable. As I mentioned, there's also a range of absolutely divine handmade desserts. Be prepared to do exercise in the morning. In the meantime, grab a bite to eat, and a lovely drink and relax amidst a very soothing (and mouth watering) ambience. And there's a great selection of drinks to be had - and yes you can even buy from a range of different flavoured teas as well. Unfortunately I only had my small pocket P&S camera, so the photos aren't that good (and I've avoided showing other people in the photos out of courtesy). I'll have to come back here again (and of course... if I'm there, it would be rude not to grab a chocolate or three). Be warned however, it's only a small cafe, and is very popular. It's advisable to book ahead on 8373 1330... especially in the evening. Just thought I'd share a "family moment" with you. Now L-kun's definitely bilingual, and to some extent we know that this has limited his development of English a little compared to comparable native-English-speaking Aussie children. It's something that's been a bit of a concern for us... but also we've been careful not to blow it out of proportion as well. Parents can be so demanding and competitive with their children, when they really need our love most of all. However, the one thing that we're absolutely happy with is L-kun's enjoyment in sharing his creativity... especially when it comes to dance, song or now... stories and "movies". When I come home from work of an evening, there's often a theatre set up, with chairs for his audience, and a "Daddy, I want you to watch my show"... before I've even had a chance to close the door. I have to admit, a big part of me wants just to plonk down and relax... when actually, watching your children play is the most relaxing thing of all. The above youtube video was taken a few weekends back (I have been too slack to do anything with it)... L-kun had just finished a whole series of drawings, and called us into his room where he had prepared something. Little did we know we were getting a real show. And what a show it was! He just made up the story as he went - and whilst I realise it's pure self-indulgence - hey, if you can't self-indulge on your own blog; what can you do? 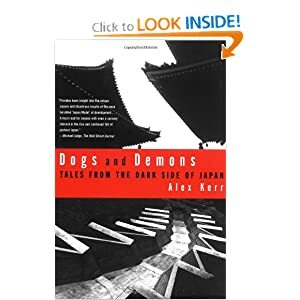 The book "Dogs and Demons - The Dark Side of Japan" by Alex Kerr is a rather grim expose on the problems seemingly endemic in (modern) Japan. 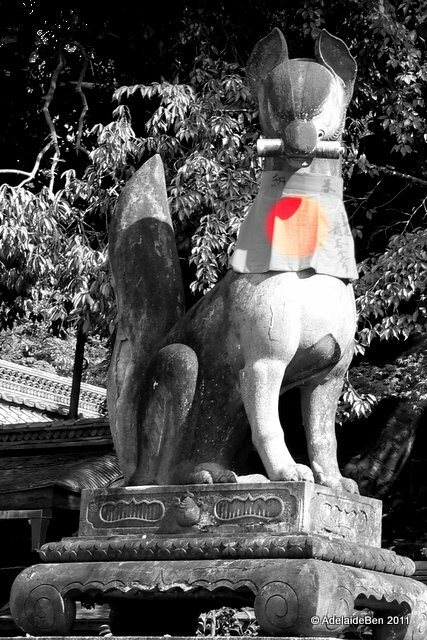 Alex Kerr, a resident of Japan for some 35years, attempts to describe the often overlooked underside of Japan - no, not organized crime, but rather the problems that he sees as being self-censoring of both Japanese and in particular Japanophiles about Japan. 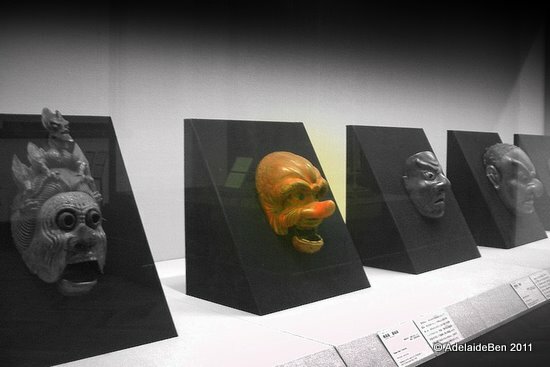 From corruption, to lack of sophistication and technology, a destruction of any meaningful connection with the deep roots of Japanese culture combined with an 'infantiling' of the new popular culture, to an almost apocalyptic fascination with the burying of nature under a protective (sterile) sheath of concrete. And indeed, there is some truth and value in the points that the Kerr makes. At one level, he identifies the waste of the wealth generated through the heady years of the 60's-80's, which was maintained even after the Japanese bubble burst in the 90's. Yet, Kerr's criticisms strike at a deeper vein. The books title, dogs and demons relates to a proverb that painting a demon is easy (any one can draw a demon), rather it's painting a dog that's hard... which he translates to a Japanese desire to distract and mis-direct Japanese self-belief through the obsessive building of monuments and superficial things whilst avoiding the harder reforms that would really improve the life of everyday Japanese. Kerr's background is in the old, having worked for a Shinto-based sect in Japan, Oomoto, and having co-owned "traditional-focussed" tourist ventures and a seller of antiquities. And in a way his book is constantly touched by the sentimentalities of the Japan of old, as he imagined it. Yet his musings seem strangely contradictory; an example of which is that he at one point criticises Japan for the cancerous spread of cedar plantation forests (with all of the ensuing health problems they create); whilst at another point he rails at Japan for it's addiction to cheap building materials and having given up on using traditional (quality) wood construction methods in the millions of homes. How many forests would be needed for that? It is the gap between the what and the how that is most obvious in his books. Indeed, I doubt any visitor to the cultural heart of Japan, Kyoto (also Kerr's home), could feel anything less than disappointment at the state of the city as a whole. A jumble of concrete, steel and cables, without design or style. The Kyoto of our dreams is hidden away, as if being subsumed by a blanket of concrete. 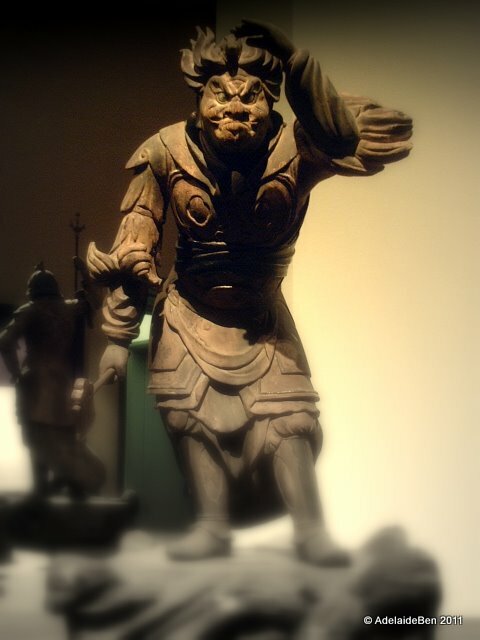 This is modern Japan, and it can be a stark reality compared to dreams of Japan's traditional past. Now I bought this book last year (and have only just read it)... thinking that it's good to get a balanced view of Japan, rather than only the view of someone that wishes to promote the good side. A noble intent; but alas, balanced is not a word that I would use to describe the book in any way. He takes an almost naive or blinkered view of the rest of the world, and especially from the perspective of how modern the West is. Hong Kong, Singapore, Malaysia and Thailand seem paragons of virtue in his perspective - as if the colonial vestiges were the backbone of their modern society. Indeed, such is the strength of this one-eyed view of the inside and outside world that I initially thought, "ah, yet another disenchanted gaigokujin for whom the glamour of Japan has worn off - having some parting pot-shots at Japan as he heads for different shores" (Kerr is based half out of Thailand now). But the more I read, the less I believed that. He is passionate about Japan, but his writing seems more designed to meet the needs of the Japanese themselves. As if to say, wake up Japan - and see what you are doing to yourselves. Indeed, he wrote his first book in Japanese, for Japanese. And I can't help but feel that perspective remains. He has become a voice of the dispossessed, knowing something's been lost and longing for a different future. Yet, such focus detracts from the books message, undermining it's credibility as one anecdote after another is used as if to show the universality of the problems. He writes with passion, but not with intellectual rigour. The disturbing message that I'm left with is, why? Kerr's Japan is a cultural desert, filled with plastic, neon and the failed monstrosities of monuments - built to divert attention from the fact that the country had sold it's soul for growth in GDP and manufacturing export. It's a place where corruption and incompetence rules, and where the Japanese people themselves have become automata designed to only consume and to provide the vast capital base for further economic abuse through mismanagement of the government. It is an unpleasant place - and one can't imagine why anyone would want to inhabit the world he creates. Now the book was originally published in 2002 (also under the name Dogs and Demons: The Fall of Modern Japan)... and Japan's economic situation has not improved. Indeed, China has now surpassed Japan as the second largest economy, and with the disaster of March 11, things must have even taken a grimmer turn. It is perhaps under these circumstances that we should take a critical look at the real Japan, with the hope that from the wreckage a more environmental and internationalised country can be constructed. The fear is that, instead Japan might slip further into introspection and denial. I have to say that book was not an easy read (for anyone that loves Japan); and Kerr's over-bearing biases and agenda reduce the potential impact of the book. Whilst parts made me angry (at his superficial analysis) - it also made me question why; why was I getting so emotional in response? In society we need the painful gadfly, to annoy us out of our comfortable stupor, and make us ask hard questions about our own beliefs. For that reason it's a useful book - but I could never say it was a great book... and one can't help but wonder, if indeed it isn't easier to paint the demon rather than the dog. Well, here's a good Japanese recipe.... Sukiyaki. This is a variant of a the hotpot cooking style, known collectively as nabemono. Once again, this style is based on the idea of communal cooking at the table. Sukiyaki is a favourite of ours...even though it's been a long time since we had it. Mirin is also used sometimes- we don't use it in our recipe, and some put water in as well. Note: The sauce is up to your particular taste, but we use the broad ratio of about 10 : 6 : 8 for the soy, sake and sugar respectively by volume. We often tune the taste during the cooking by adding more sauce ingredients as we go. Now the beef used is the same very thin beef used in many different hotpots and steamboats in Chinese cooking, so you can normally find this easily in your local chinatown grocers. Now the shirataki are very low carbohydrate Japanese noodles made from the yam, known as konnyaku. Konnyaku is often served as a jelly-like ingredient, cut into large slices. Indeed it can be added into sukiyaki in this form as well. T-chan's family often put the udon noodles in at the end of the meal, and cook in the residual sauce... yummy. The thing that makes sukiyaki distinct is that the cooked ingredients are coated in raw egg and beaten (toki tamago). Make sure your eggs are fresh... and we always use free-range. You only need to beat lightly, just enough to break the yoke. L-kun loves breaking eggs and beating them.... and that means that the cooking is about to begin! Now the order of cooking is pretty simple... the one important implement is the table gas cooker (camp cooker is perfectly ok). As always, be careful with hot plates etc, especially when children are around. We use a specific sukiyaki pan, but I'd imagine any heavy iron/stainless steel pan would suffice. Normally you'd use beef fat to coat the pan as it heats up, then add the sauce (dashi) bring the sauce to the boil and melt the sugar and keep the temperature reasonably high then add in the cabbage, carrots, mushrooms, onion... and of course beef.. actually you can pretty well throw it all in at this stage and start cooking. After the ingredients have started to cook (fairly quick). Add in the shungiko (chrysanthemum) last, as they will cook down very quickly. Now, you're ready to eat. Just grab the cooked ingredients (meat and vegetables) and dip into the egg - and in your mouth. Simple and delicious. And also very healthy. One of the great Japanese dishes! We also use the left-overs (we tend to over-stock ingredients) for sukiyaki-don, i.e. sukiyaki on the rice... just heat up the cooked sukiyaki up on the stove, and add the beaten egg over the top (cooking just a little) before serving on top of a bowl of rice. It may be especially good to warm the stomach on a cold winter's night, but it's equally good all the year round.